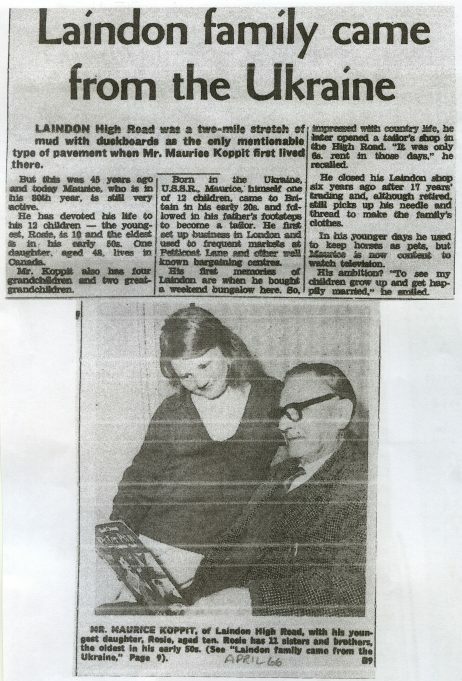 Shortly before this website was launched, David Koppit brought some photographs and family information along to the Laindon Library. His father Maurice Koppit had been a tailor in Langdon Hills. 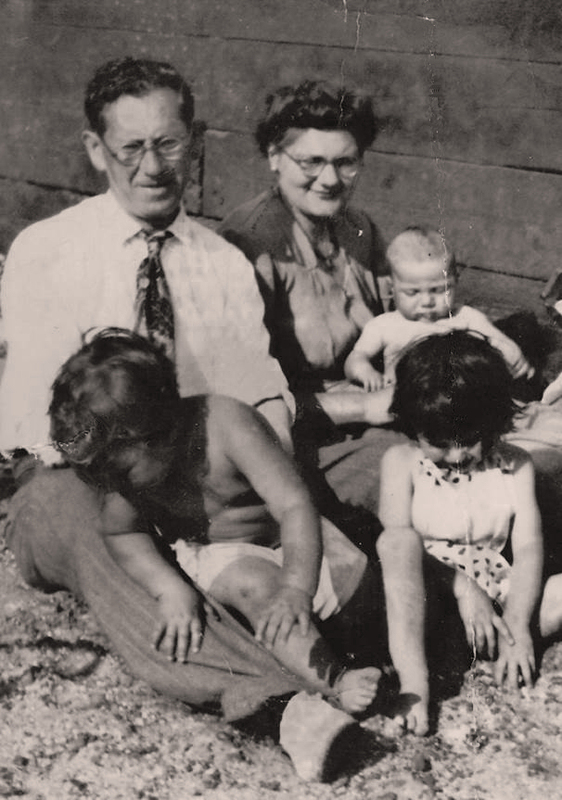 Maurice Koppit and his wife Gwenda lived and worked in Langdon Hills. He ran a Tailor shop on the east side of the High Road, north of the junction with Emanuel Road, in a terrace of four shops. Described as a ‘Costumier’, his address in 1951 was 4, Bolsover Terrace, Langdon Hills, telephone number Laindon 3319. The family had originally come from Russia where they apparently had connections with Tzars – stables and horses (breeding). It would appear that the family originally settled in East London but had moved to Laindon by 1939 when ‘M Koppit’ won first prize for the ‘Best Led Horse’ in the Laindon Carnival. Maurice and Gwenda had several children including Zelda, Geoff, Sidney, Rachel, David, Helen and Rosie all of whom went to Langdon Hills Primary School and Laindon High Road School. An article published in a local newspaper in April 1966 reads as follows: Quote “Laindon Family came from the Ukraine. Laindon High Road was a two-mile stretch of mud with duckboards as the only mentionable type of pavement when Mr Maurice Koppit first lived there. But this was 45 years ago and today Maurice, who is in his 80th year, is still very active. He has devoted his life to his 12 children – the youngest, Rosie, is 10 and the eldest in his early 50s. One daughter, aged 48, lives in Canada. Mr Koppit also has four grandchildren and two great-grandchildren. Born in the Ukraine U.S.S.R., Maurice himself one of 12 children came to Britain in his early 20s and followed in his father’s footsteps to become a tailor. He first set up business in London and used to frequent markets at Petticoat Lane and other well-known bargaining centres. His first memories of Laindon are when he bought a weekend bungalow here. So, impressed with country life, he later opened a tailor’s shop in the High Road. “It was only 6s. rent in those days” he recalled. He closed his Laindon shop six years ago after 17 years’ trading and although retired, still picks up his needle and thread to make the family’s clothes. In his younger days he used to keep horses as pets, but Maurice is now content to watch television. His ambition? “To see my children grow up and get happily married,” he smiled. Unquote. 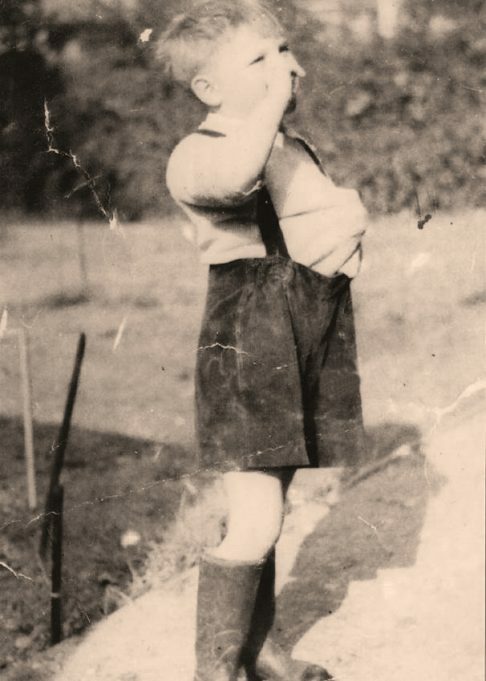 Many thanks to David for sharing his photographs and family history with apologies for the delay in publishing them. I believe Zelda was in my class at Langdon Hills CPS. I never really knew her though but do recall her father’s shop. My mother who was a tailoress quite often spent time in the shop as Mr Koppit had good supplies of thread trimmings etc, I remember him quite well. That small parade of shops also had a music shop, we always bought sheet music of the current times. I was learning to play piano. Mothers name Nell Waters and lived in Salisbury Aveue. Do I read this correctly? No mention of any wife but Glenda yet Maurice has children ranging in age from the early fifties down to ten years. Over forty years of child bearing! This must be some sort of record. Is’t possible? Hi Alan. I had also noticed the time factor here when putting the article together. I think we are safe to assume that Gwenda was Maurice’s second wife and that the older children mentioned were from a previous marriage. I was unable to include details of a previous wife because that wasn’t amongst the information provided. 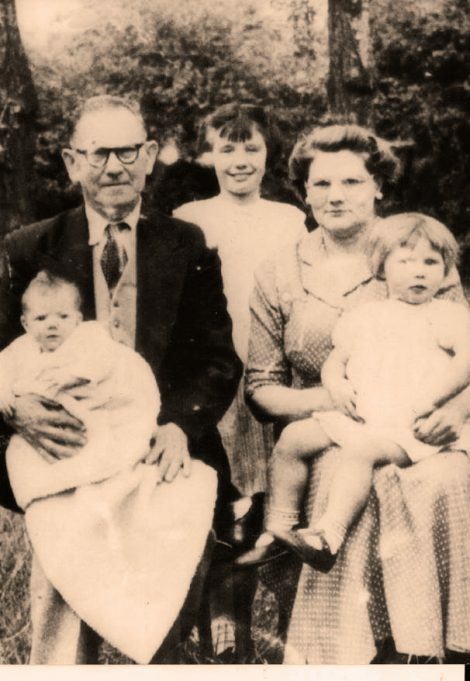 The online records show that Maurice and Gwenda married in Billericay 1950. I can find no record of an earlier marriage, so no doubt that had taken place in the Ukraine before he moved to UK. In the circumstances, I decided to concentrate my article on the family he had in Langdon Hills. I have however, now added Maurice and Gwenda’s birth and death records to the article. Cheers.